When organisations look for accounting and finance candidates, they obviously search for candidates with the necessary education and certifications. However, a portfolio of “soft skills for accountant” can make you a more balanced, successful and professional accountant. 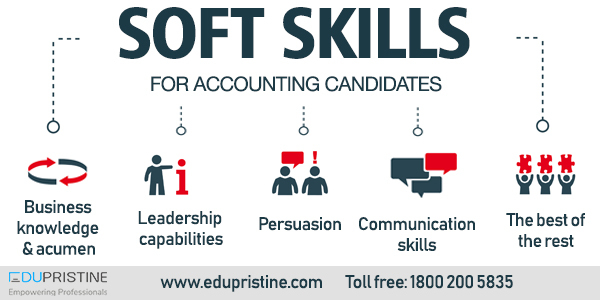 Thus, finance aspirants are in dire need of soft skills training programs, and the reasons are obvious. Candidates need astute business understanding if they are to successfully help develop strategy, inform key decisions and work on cross-departmental collaboration. Hence, candidates must be able to see the big picture and understand how their job impacts the company as a whole. When companies hire, they look for professionals with strong leadership skills, who can step into more senior roles when the time is right. Good leaders communicate well; they think about their audience and how their words are interpreted. Human resources professionals will commonly say that “building consensus” is a key characteristic for a leader. Good managers persuade team members to work together to achieve a goal. Persuasion is as much about your own self-confidence as your ability to analyse a situation and come up with a plan. Accounting and finance staff need to be able to tell the story behind the numbers in an easy-to-digest manner. The effectiveness of words is not measured by volume. For this reason, written, verbal and even visual communication skills are critical for success in accounting and finance jobs today. Certainly, for accounting and finance professionals who manage company funds, qualities such as attention to detail, accuracy, and a highly developed sense of discretion and confidentiality are indispensable. Are you waiting to get hire by top financial institutions? Join Eduprisitine. However, we offer a plethora of courses in Accounting and Finance, while giving you integrated soft skills training programs.